The Sylvania Wilderness is part of a landform region known as the "Northern Highlands", which consists of north-central Wisconsin and a portion of the adjacent Upper Peninsula (UP) of Michigan. The geologic history of this region has been traced back to the earliest geologic period, the Precambrian, that ended about 600 million years ago. Molten material which solidified when it cooled (referred to as igneous rock) and sediments altered by the action of heat and/or pressure (referred to as metamorphic rock) form the Precambrian core of the North American continent. Each continent has at least one such core, called 'shield', because they bulge up toward the center like medieval battle shields. The North American shield is referred to as the 'Canadian Shield' because the largest portion of the exposed rock is located in central and eastern Canada. Peripheral parts of the Canadian Shield are covered by several layers of more easily erodable sedimentary rock which were deposited when ancient shallow seas repeatedly advanced and retreated. A gradual uplifting of north-central Wisconsin and a portion of the adjacent UP during the past 200 million years resulted in the formation of what is known as the Wisconsin Dome (hence the name "Northern Highlands"), which led to the exposure and erosion of much of the sedimentary rock layers in this region. The bedrock of the Northern Highlands is, therefore, mostly Precambrian while that of the surrounding areas is the younger sedimentary rocks. During the last 2 million years, referred to as the 'Ice Age', glaciers repeatedly advanced and retreated across the northern and central parts of North America. This glacial activity has shaped the bedrock and covered it with unconsolidated material, called glacial drift. It is this activity that is largely responsible for Sylvania’s present landscape. An ice sheet grows when more snow falls in winter than melts the following summer. As the sheet increases in height, it begins to move under its own weight. The advancing ice margin tends to have a scalloped or lobate outline because differences in the shape and elevation of the land surface result in differences in the speed and direction of the ice flow within the lobes. The advancing ice scrapes and grinds the rock. It picks up rock debris of all sizes and transports it to the ice margin where it accumulates and forms ridges, called moraines, that run parallel to the margin. These ridges are known as terminal moraines when they mark the maximum extent of the ice. Some of the finer material is carried away from the ice margin by meltwater and is deposited in outwash plains. Ground moraines are the debris dropped by the melting and retreating ice when more snow melts in the summer than was deposited the previous winter. In general, all material deposited by ice is called drift. Till is the unsorted mixture of rock fragments of all sizes deposited directly by the ice. Material deposited by meltwater running off or under the ice is sorted or stratified drift because as the water slows down, it deposits the largest, heaviest fragments first. When ice and water act together, ice-contact stratified drift is deposited. An example of this are eskers which form when rivers of meltwater flow in tunnels under the ice. The debris that accumulates in the tunnels turns into snakelike ridges, called eskers, when the ice melts. Another landscape feature that sometimes forms beneath the ice is the drumlin. The genesis of drumlins is still being debated. They are elongated, spoon-shaped hills, usually occurring in 'swarms' of 50 to 500, that are lined up parallel to the direction of the ice flow. Blocks of ice of all sizes can become detached from the melting ice sheet and buried by the debris left behind. Subsequent melting of these blocks causes the overlying rock debris to collapse and to form a hummocky topography. Very large blocks are responsible for the formation of kettle holes which, if they are deep enough to intersect the groundwater table, become lake basins. Moving ice is capable of plucking fragments of bedrock and transporting them some distance. Such fragments are called erratics because they are different from the rock native to the area in which they are found. An example are the fragments of copper, some weighing hundreds of pounds, found in the glacial drift of the UP and northern Wisconsin. Their source is the Precambrian bedrock of the Keweenaw Peninsula of the UP and Isle Royale in western Lake Superior; both are locations of prehistoric copper quarries. Ice sheets advanced and retreated several times across the Northern Highlands during the past 2 million years, each obliterating or burying evidence of the previous one. Therefore, the most recent advance, known as the “Wisconsin Glaciation,” had the greatest impact on the present landscape. The ice sheet of the Wisconsin Glaciation advanced southward from Canada about 26,000 years ago. As the ice moved out of Lake Superior and into northern Wisconsin, it formed two major ice lobes, the Superior and the Chippewa Lobes. A third major lobe, the Green Bay Lobe, covered eastern Wisconsin. The ice sliding across Sylvania was, however, a minor lobe flowing between the Chippewa and Green Bay Lobes. The margins of the lobes at the time of their maximum extent, about 18,000 years ago, were located south of the UP, in Wisconsin, and are marked by terminal moraines. The ice then retreated in response to a moderation in climate. A significant readvance occurred about 12,00 to 13,000 years ago, but this time the ice margin did not reach as far south because the climate was getting milder. The ice lobe that covered the western UP at that time, known as the Ontonagon Lobe, stopped near the UP/Wisconsin border where it deposited the western section of the Winegar Moraine. The very hummocky character of the Winegar Moraine is attributed to the stacking of glacial debris containing blocks of ice, either as a result of minor fluctuations of the ice margin or as a result of debris deposited by the Ontonagon Lobe on top of debris deposited by older ice flows. Following the retreat of the ice, more readvances occurred around 10,000 to 11,000 years ago but the ice margins, depositing the Watton and Sixmile Moraines, did not reach the Sylvania area. Since Sylvania is located near the UP/Wisconsin border, its dominant landform is the very hummocky Winegar morain with its many kettle lakes and bogs. Outwash plains and ice-contact stratified drift are also present. The glacial drift (generally more than 30 feet or 100 meters thick) is largely derived from the bedrock, so is composed mostly of metamorphic and igneous rock fragments. 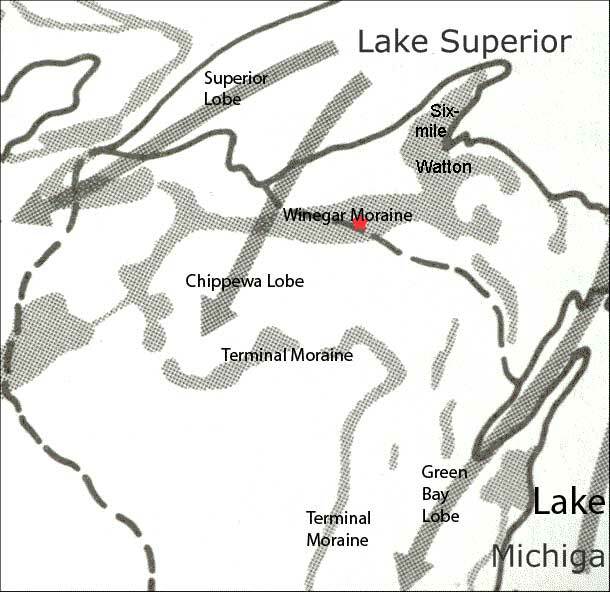 The center of the uplift that led to the formation of the Wisconsin Dome is located in Vilas County in Wisconsin and Gogebic County in Michigan. It represents the divide between three watersheds: Precipitation falling to the north of it flows through the Ontonagon River toward Lake Superior, precipitation falling to the south flows through the Wisconsin River toward the Gulf of Mexico, precipitation falling to the east flows through the Paint River toward Lake Michigan. The town of Watersmeet, about 8 miles east of Sylvania, is located in the area of this divide, hence its name. The highest elevation is, however, a swarm of drumlins to the east of Watersmeet.